The Cuban tree frog, scientifically known as frog Osteopilus Septentrionalis, is an amphibian inhabiting the regions of the Caribbean of the Western Hemisphere. 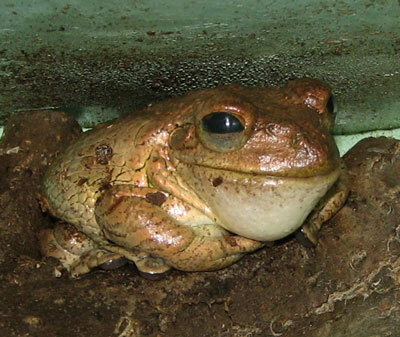 In North America, this is the biggest tree frog. Because it is a Voracious eater and has the capability to prosper along with human beings. It has become a species that, to a great extent, inhabit the colonies of North Florida and the Oahu Hawaiian Island, while passing along the Caribbean islands. Usually, Cuban tree frogs are reared as pets, but on account of their secretion of a toxic mucus that emerges from its skin and leads to a burning sensation to the eyes, it is not advisable to keep it as a pet. 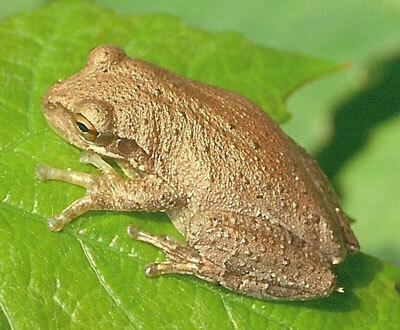 It is stated by several people that ever since the Cuban tree frog arrived in their yard, they saw other toads, frogs and even lizards, vanishing, the reason being, Cuban tree frogs are gluttons, and unfortunately, they feed on frogs of Florida, toads and lizards, apart from spiders and insects. Actually Cuban tree frogs are so successful in inhabiting Florida and consuming their local frogs, that they are considered as a variety of alien (not native) intruders. These Cuban tree frogs are a danger to the ecology of the indigenous environment and the flora and fauna. 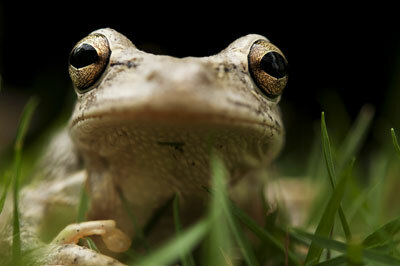 The Cuban tree frog is the biggest tree frog of North America; its length is 3 to 5.5 inches (76 to 140 mm). The skin of this frog is warty and it has a bigger toe pad when compared to the other tree frogs, their eyes are mostly tinted orange, but differs in color from grayish white to olive-brown or bronze. According to the environment and temperature, the Cuban tree frog alters its color. Numerous individual frogs possess dark stains on their backs and a few bands of stains on their legs. In several frogs, the concealed part of their legs are colored bright yellow. When they encounter a predator, they leap in order to escape from it, when this bright-yellow splotch becomes visible and perhaps confuses the predator. Besides, the fusion of the head’s skin with the skull, causes the skin to become motionless when you rub a mature frog in between its eyes, a typical adaptation to avoid loss of water, especially because of the fewer blood vessels in this “co-ossified” (fused) portion. When they are held by hand, these Cuban tree frogs ooze out poisonous mucus from their skin. This may lead to allergy for some people who react by feeling a burning sensation in the nose and eyes and in certain cases, it may cause asthma. Cuban tree frogs are “Dimorphic”; females being bigger than the males. A breeding male displays a nuptial pad, black in color on its thumbs. This assists the male to grip the female while mating. The Cuban tree frog is an expert climber. Mostly, they go to sleep in the daytime on the ground and at night, they hunt for insets where there is artificial light. They consume all that they can capture and that enters their mouth. This includes spiders, snails, other frogs and insects (even their fellow beings), lizards, snakes, bird hatchlings from the nests and tiny crustaceans. While foraging, they even climb utility poles, and this leads to short-circuiting of power switches, resulting in heavy loss of power. The Cuban tree frog is understood to have hitched free rides in ships carrying potted plants, packaged boats and several motorized vehicles. On arrival at their new destination, these frogs turn into an invasive variety. They possess various traits in forming colonies, like the high fecundity, reducing their generation period, adopting different diets, efficient ability in competing, and also the capability to adjust with human beings. Besides, to have a restriction on their predators that are found in nature, they ooze out a poisonous mucus through their skin. It is understood that Cuban tree frogs dwell in a variety of habitats, like estuaries, small towns, low-density suburban expansions, cultivation areas (especially those with alien plants), swamps and forests of low lands. You can see them normally in shady habitats, especially between trees and shrubs, rain barrels, cisterns and buildings. In the United States, we get Cuban tree frogs in normal pet trade centers. They are cheap and if you look after them well, they will survive for 5 to 10 years. When the mating season starts, the males will call out to the females. Accommodate a male along with a female in a terrarium of size 29 to 30 gallons and ensure you give them sufficient food to avoid savaging. Keeping 2 or 3 females along with 1 male, increase the possibility of having more eggs. Females lay their eggs in clusters in the bowl of water. After the female lays eggs, place them in another tank or in a bowl in which fresh water is filled and keep them as such till they are hatched. It is convenient to transport them with a spoon by carefully scooping them. Once the tadpoles are hatched, you will get plenty of them. Till they get mature into frogs, feed them with fish food obtained from the markets. Keep a watch on them and when you observe legs emerging, keep a few rocks in the tank and provide more space. Allow them to emerge out of the water. In due course provide every frog sufficient area and enough land for their comfort. In case their numbers overwhelm you, do not leave them in the wild. Being an invasive variety in Florida, they will consume all other frogs, reptiles and insects at great speed, especially because of their gluttonous appetite. A terrarium of size 15 to 20 gallon is quite sufficient for a mature Cuban tree frog. Provide them with enough of plants with branches for them to climb and a big swimming pool where they can swim a while and not touch the bottom of the pool. The best method of getting one is to purchase a dog water bowl, having a flat bottom and pour fresh water into it. Also place one or two strong rock pieces that project from the surface. The best substrate is a combination of 60% potting soil and 40% peat moss to a depth of 3 inches. In intervals of 2 to 4 months, replace the substrate. Using paper towels or newspaper may restrict the easy movement, in and out, for your tree frogs in the bowl without difficulty. In order to ensure your Cuban tree frog is safe in the terrarium, place natural or artificial plants with sufficient branches for them to climb besides providing hideouts for them on the floor. Either a cocoanut shell, cut and made like an igloo or some artificial hideouts will do fine.. All you need is your frog’s comfort. Make sure that the hiding place is just sufficient for it to rest. The Cuban tree frog consumes crickets all through its life. They have an immense appetite, so give them enough food to satisfy their hunger, Feed the matured ones thrice a week for 15 to 20 minutes. And feed the juveniles every day. In case you deprive them of sufficient food, it is said that they may turn cannibalistic and consume other frogs within the tank. On alternate weeks give your matured frogs a pinkie mouse to fill their stomach. Its big size needs this. Never give them too much pinkie mouse; this will lead to developing fat in the system causing disease of the liver. In the case of a purchased Cuban tree frog, never attempt to hold it for a long time. Frogs, in general, dislike being held in the hand. They try to glide out of your hand and get away. In case you desire to handle these frogs, hold them only for a short while, after which wash your hands properly. Amphibians are capable of drawing in salts and chemicals through their skin, as such any sort of soap, sweat or lotion remaining on your skin will harm your Cuban tree frog.